Assessments of the value of philosophical inquiry range from Socrates' principled assertion at his trial that "the unexamined life is not worth living" to the snarky (albeit clever) crack, often attributed to physicist Richard Feynman, that "philosophy of science is about as useful to scientists as ornithology is to birds." Practitioners, investigators, and teachers of psychiatry and related disciplines would be well advised to put aside whatever suspicions about philosophy they might share with the jury pool of classical Athens or with self-assured modern physicists and engage in a serious examination of the foundations of their discipline. In the present edited volume, philosophers Şerife Tekin and Robyn Bluhm have brought together an outstanding, international cast of authors whose product will facilitate exactly that. Although theirs is not the first compendium of the wide range of scholarly work that comes under the heading "philosophy of psychiatry," it is doubtless the most accessible up-to-date work currently available. In addition to students, trainees, and practitioners of psychiatry and clinical psychology, it will be of enormous value to undergraduate and graduate students of philosophy and to professional philosophers looking to augment their understandings of a rapidly evolving arena within their discipline. The book is divided into eight parts, each (following the introductory section) relating to an aspect or subdiscipline of philosophy as it intersects with psychiatry. Although one could question particular elements of this taxonomy, or quibble with the placements of some of the chapters within it, the organization of the volume generally works well, aggregating related topics and supplying an internal logic that can be difficult to achieve in multiply authored edited works. For the most part, the earlier chapters of each section address more fundamental philosophical topics while later chapters cover more specialized ones. Readers with only casual acquaintance with philosophy of psychiatry might be surprised at the range of questions to which its practitioners address themselves. They (particularly those past a certain age) might also be shocked at the omission of psychoanalysis as an object of philosophical scrutiny. To the extent that field has become an academic dead letter, the editors' decision against its inclusion is defensible. And to the extent that such decisions contribute to its continuing demise, its resurrection seems improbable. As with all such edited works, the assumed level of prior knowledge is not homogenous across chapters, although the disparities are not dramatic. As alluded to above, the greatest strength of the book lies in the expertise of so many of its authors, whose early-career statuses in several instances provide cause for great optimism about the future of this vital subdiscipline. The commentary that follows is divided into the eight sections of the volume under review. In Chapter 1, "Introduction to Philosophy of Psychiatry," the book's editors employ the widely recognized diagnostic construct of ADHD to introduce readers to the likelihood that they have already engaged in philosophy of psychiatry, lending familiarity to some of its core questions. Chapter 2, "What is Psychiatry?," is authored by Mona Gupta and provides a useful introduction for students (and others) unfamiliar with psychiatry and the structure of medicine as a discipline. This section begins with Chapter 3, "Understanding the Nature of Mental States," in which Jesse Butler provides a superb introduction to the mind-body problem and its relevance for psychiatry, and to functionalism as a popular solution – albeit one that leaves significant problems unaddressed. Although he makes a cogent case for explanatory pluralism, he arguably puts too much stock in the biopsychosocial model as an exemplar of such pluralism, answering some objections to it persuasively while inadequately attending to its failures, both conceptual and practical/clinical. In Chapter 4, "Frequently Asked Questions About Mental Disorders," Ginger Hoffman explicates some of the most common ways in which modern psychiatry and neuroscience are misunderstood (including by their own practitioners) – e.g., "Aren't mental disorders just chemical imbalances?" She provides wonderful explanations of how philosophical questions as applied to psychiatry and neuroscience are anything but arcane and are, instead, implicit and vital to those disciplines. This chapter should be read by all medical students, residents in psychiatry and neurology, and many others. Chapter 5, "Psychopathy, Autism, and Basic Moral Emotions," authored by Erick Jose Ramirez, addresses whether – and, if so, how – moral judgement is rooted in emotional experience. He introduces and then challenges the notion that a handful of "basic emotions" constitute a universal foundation for adjudicating disagreements about morality. The chapter brings to bear research on psychopathy and autism to support updated theories about emotional experience, the nature and origin of empathy, and related matters. Finally, in Chapter 6, "Anorexia Nervosa and the Embodied Mind," Lana Kühle articulates an argument for a less "brainbound" approach to both philosophy of mind and psychiatry, invoking the phenomenon of anorexia nervosa to suggest an "embodied mind" approach as a potentially more successful means of conceptualizing and treating that condition. The third part of the book consists of two chapters. Chapter 7, "Merleau-Ponty and the Foundations of Psychopathology," by Anthony Vincent Fernandez, is conceptually challenging, at least for those of us less skilled at grasping the Continental philosophical tradition. The author helpfully outlines the development of phenomenological approaches to psychopathology and points out the difficulties entailed in applying phenomenological methodology – especially identifying and suspending implicit presuppositions so that "the matters themselves" can be examined and understood. In Chapter 8, "Transformation through Dialogue," Constantin-Alexander Mehmel employs the theories of Hans-Georg Gadamer to understand depression as a problem of impaired intersubjectivity. For readers without backgrounds in this sort of philosophy, the material in this chapter will likely prove more elusive than that in other parts of the book. This section begins with Chapter 9, "Philosophy of Science, Psychiatric Classification, and the DSM." Following a helpful, capsulized history of the DSM project, Jonathan Tsou expresses concerns about the validity of DSM categories but arguably devotes too little attention to what "validity" in this context might mean. Thus, although he entertains seriously the objections to assumptions that the DSM can classify natural kinds (e.g., Hacking's "looping" effects), he seems to subscribe to a roughly essentialist ontology of mental disorders – and one that is best (and even currently) described in terms drawn from (neuro)biology. For example, he asserts, at least tentatively, that "depression can – to a large extent – be identified with a stable set of biological properties (e.g., deficient activity of serotonin) …" (p. 190), a notion whose empiric support is thin at best. Nevertheless, his conclusion that the DSM project has failed in its explicit aims is both accurate and important for the field to acknowledge. Aaron Kostko's Chapter 10, "Inductive Risks and Psychiatric Classification," provides a rigorous, interesting, and important discussion of the roles of, and potential conflicts between, epistemic and non-epistemic values in psychiatric research, referring specifically to information used in making decisions regarding revisions of DSM diagnostic criteria. He (perhaps necessarily) adopts what could be viewed as an overly credulous/realist stance toward the status of DSM categories like "bipolar II disorder," invoking concerns about "false negative" and "false positive" outcomes of the psychiatric diagnostic process. Although over-inclusiveness and under-inclusiveness are both problems with which those who formulate diagnostic criteria must contend, in the present context, in which the ontological status of the categories themselves are at issue, it is unclear what evidence for or against revisions of the criteria by which diagnoses are assigned would even look like. More broadly, however, the chapter's systematic assessment of what its author labels value-free versus value-laden ideals in conceptualizing psychiatry is cogently presented. In Chapter 11, "Causal Explanation in Psychiatry," Tuomas Pernu points out that the matter of causal explanation is absolutely core to the medical enterprise, and with respect to philosophy of psychiatry the vital question relates to whether genuine mental causation is possible, or compatible with physicalism. Some of the author's choices of areas on which to expand (or not) seem odd. The chapter could have benefitted from greater specificity on the "dependency" versus "production" views of the nature of causation, and on what the "interventionist" account of causation means in the medical/psychiatric context. Similarly, the author's challenges to the proposition that mental states are multiply realized are insufficiently developed for the reader to accept his apparent assimilation of the notion of mental states with broad categories of mental/behavioral phenotypes like schizophrenia and addiction, and thus the implications claimed therefrom. 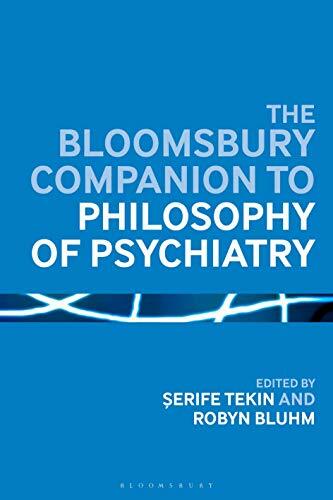 The chapter does, however, make clear that this is an active arena of current work with great relevance to psychiatry, and will stimulate readers to think and read more about it. The section closes with Chapter 12, "Trauma-Informed Psychiatric Research," in which Ami Harbin provides an overview of trauma-related research in clinical psychology. She defines "trauma-informed approaches" to practice and research, pointing out that trauma is conceptualized in non-individualistic ways – i.e., as a societal phenomenon whose social and political dimensions are inextricable parts of it. The author asserts that research on trauma is thus value laden from the start, calling for application of a trauma-informed lens in order to attend to its intrinsic social and political elements. The first entry of this section, Chapter 13, "Informed Consent in Psychiatry," is co-authored by Claire Pouncey and Jon Merz. This is an arena of more obvious import and familiarity to clinicians and researchers than some of the others addressed in the book. The authors present a comprehensive and clearly articulated treatment of the subject, including philosophical, legal, and clinical (including clinical research) perspectives, applicable to general medical/surgical (i.e., psychiatric consultation) and primary psychiatric settings. They emphasize throughout that informed consent entails both moral and epistemic agency and they make clear that while psychiatric illness complicates the problems of informed consent, it does not obviate the centrality of the principles involved. Chapter 14, "The Ethics of Coercion and Other Forms of Influence," deals with what is perhaps the single most important element in ethics as it relates to psychiatry. Its author, Kelso Cratsley, provides a theoretical background on this fraught matter that is carefully and precisely written and that will reward the attentive reader. He adduces more empirical data than one might expect of philosophical analyses. Such evidence is clearly useful even if empiric findings can never be dispositive with respect to conceptual and normative claims. The chapter's philosophical and scientific rigor is commensurate with its practical focus on clinical ethics. In Chapter 15, "Voice, Silencing, and Listening Well," Nancy Potter articulates her plea for "real democracy," exposing neoliberalism as an impediment to it, and structural violence and oppression based on actual or perceived group membership as manifestations of its absence. She identifies mental illness, via the mechanism of stereotyping (among others), as one object of such oppression. Structural violence and oppression are shown to manifest in the realm of communication, in which those who represent disfavored groups are epistemically discounted and thereby silenced. The author takes a while to return to applications to psychiatry, but the more general material is well worth readers' time, as it expertly and compellingly explains contemporary work in this area. The chapter could arguably fit into the (later) Social and Political Philosophy section of the book, but its implications for clinical practice must be taken as serious ethical imperatives, thus justifying its placement in the section on ethics. Michelle Ciurria, in Chapter 16, "Mental Illness, Agency, and Responsibility," seeks an alternative to the blanket assumption that mental illness and responsibility are incompatible – which seems untenable from both principled and practical perspectives. After reviewing some alternative theoretical formulations of responsibility, she settles on the agency-enhancement view of Manuel Vargas. Rather than approaching the question of agency and responsibility as qualities that are or are not possessed by particular people at particular points in time, she takes a sort of functionalist approach, essentially asking, "What would praise or blame accomplish (therapeutically) for this person at this point in time?" Responsibility is defined in reference to answers to that question. Although the author credits the DSM and its diagnostic categories well beyond what they warrant (e.g., taking seriously the notion of "intermittent aggressive disorder"), the adverse effects on her overall argument are minimal. The content of the final chapter of this section, Chapter 17, "Philosophers, Psychopaths, and Neuroethics," overlaps to some extent with that of the previous chapter, but its focus is on psychopathy. Its author, Matthew Ruble, draws on the work of Peter Strawson on "reactive attitudes." He reviews philosophical claims that psychopaths lack the conditions for moral responsibility and cogently exposes the ways by which adducing neuroscientific (functional imaging in this case) evidence to draw philosophical conclusions is prone to serious reasoning errors. The author concludes that reconceptualizing the object of opprobrium from the psychopathic actor to his or her act obviates some of the problems found in this area of work. In Chapter 18, "Neurodiversity Theory and Its Discontents," Robert Chapman points out that neurodiversity is at this point a grassroots movement to which little serious academic attention has been paid. He outlines the neurodiversity paradigm, contrasting it with the pathology model and revealing that disagreements between the two are sometimes question-begging, given the various paradigmatic/axiomatic assumptions inherent in each perspective. Autism and schizophrenia are presented as test cases, taking seriously the applications of as well as objections to the neurodiversity paradigm for each. The author challenges readers to consider whether the suffering associated with phenomena routinely conceived within the pathology paradigm might be better understood as sequelae of social marginalization and oppression. In Chapter 19, "Managing Individuals and Populations through Psychiatric Classification," Devonya Havis and Melissa Mosko invoke the work of Michel Foucault to assert that psychiatry as a social institution exercises both disciplinary power over individuals and biopower over groups through classification of abnormality that must be "managed." The objects of such classification and management include women who fail to embody the social expectations of femininity and docility, and the poor and members of racial minorities who are seen as dangerous and prone to criminal behavior. Lastly in this section, Chapter 20, "The North African Syndrome: Traversing the Distance to the Cultural 'Other,'" takes to task claims that asymmetries of power and vulnerability in psychiatry have vanished in the face of increasing attention to the importance of the therapeutic alliance and its democratic underpinnings. The argument of its author, Bryan Mukandi, is beautifully – even poetically – presented and illustrated. He employs Frantz Fanon's 1952 essay, "The North African Syndrome," to great effect in demonstrating the depth of the chasm of understanding separating clinicians of dominant cultures from patients who represent a "cultural other," making contemporary efforts at "cultural competence" seem banal and grossly inadequate to the vital task of bridging it. The penultimate division of the book draws together material that is foundational to the theory and practice of psychiatry. Although its chapters could have been apportioned to other sections, coalescing them here seems justifiable. Chapter 21, "Mental Disorder, Free Will, and Personal Autonomy," written by Christian Perring, addresses a core area of philosophy of psychiatry with relevance to folk-philosophical formulations, family relations, and legal contexts, among other arenas. The author provides a brief introduction to the broader question of free will/determinism that is tailored well to the more specific task at hand in this chapter. He moves on to review philosophical accounts of personal autonomy as preparation for addressing the question of whether mental illness can validly be characterized as entailing a loss of it. The chapter concludes with humility about the likelihood that the question of whether mental illness (using addiction as a prototype) entails loss of autonomy and responsibility will be answered definitively, suggesting the possibility that the consequences of our attitudes toward the addicted might (at least tentatively) legitimately drive our conclusions. One of the most fundamental problems in philosophy of psychiatry is the subject of Chapter 22, "Metaphysical Problems in Psychiatric Classification and Nosology." Its author, Peter Zachar, divides his remit into three sections: ontology, causality, and the nature of clinical entities. In the first he introduces the Szaszian repudiation of the very concept of mental illness, alongside the naturalist accounts of Christopher Boorse and Jerome Wakefield. On the subject of causality, a precis of Hume's account underpins a discussion of the problematic nature of causality in general and its complicated applications to psychiatry. The final section contrasts three metaphysical views – medical, factor-analytic, and causal network models – of what psychiatric disorders are. The net effect is to reveal that metaphysics, far from being excessively esoteric, is central to all scientific enterprises. In Chapter 23, "Scientific Realism, Antirealism, and Psychiatric Diagnosis," Sam Fellowes picks up on the ontological questions of the previous chapter, focusing on the "realist"/"antirealist" dichotomy regarding psychiatric diagnoses. He distinguishes metaphysical from epistemic (the latter term employed here in a somewhat idiosyncratic but nevertheless understandable sense) forms of realism/antirealism and maps that distinction onto Haslam's four types of "kinds" (natural, discrete, fuzzy, and practical) account, showing the complexities involved in defining "realist" and "antirealist" in this context. The upshot is that the question of whether psychiatric diagnoses reflect the structure of the natural world or are instead reflective of decisions made by psychiatrists is an important one, even if the realist/antirealist distinction is not itself one that is cleanly defined or implemented. The section concludes with Chapter 24, "Social Epistemology and Psychiatry," in which Anke Bueter presents an unusual density of important conceptual background and insight, reflected among other ways in her exhaustive reference list. She suggests that individualistic accounts of knowledge and belief are inadequate, both descriptively and prescriptively, and that social contexts and practices need to be incorporated into such formulations. This material is highly relevant in the context of current attention to and concerns about epistemic justice in psychiatric settings and democratic pluralism in the production, evaluation, and application of socially important knowledge (e.g., regarding conceptualization and classification of psychiatric disorder). The author presents a sophisticated and nuanced treatment that notes that the aim of social epistemology is not wholesale rejection of claims of scientific objectivity but, rather, improvement of understanding of the socially embedded nature of the knowledge-production enterprise. The book closes with two broadly based chapters. Chapter 25, "The Functions of Diagnoses in Medicine and Psychiatry," authored by Hane Htut Maung, begins with a useful and articulate summary of the conceptual foundations of diagnosis in general medicine. Although the functions of diagnosis are several, the author makes a strong case for the proposition that the job of explanation is central to justifying the other roles of diagnosis, including but not limited to prediction and intervention. He points out that, in psychiatry, diagnoses are descriptive rather than explanatory – i.e., that psychiatric diagnoses are constituted by their symptoms and thus cannot explain them. This, combined with questions about the likely complex causal structures of psychiatric phenomena, is shown to relate to several recent critiques of psychiatric diagnosis. The chapter contrasts psychiatric diagnosis with a somewhat idealized notion of diagnosis in general medicine (ignoring constructs like, for example, fibromyalgia and irritable bowel syndrome that are constituted by, and thus cannot explain, their symptoms and which comprise a significant portion of general medical practice), but its points are no less important for that. In Chapter 26, "Mental Health and Illness: Past Debates and Future Directions," Reinier Schuur begins with a focus on Szaszian analysis and responses to it regarding what might be meant by "mental illness," which could have found a home in the introductory section or in the section on metaphysics and epistemology. But he goes on to make use of that material to question whether traditional tools of conceptual analysis, and acceptance of the fact/value distinction, can elucidate the fundamental question of the status and nature of mental illness. He suggests that recent developments in philosophical methodology – in particular those that place greater emphases on empirical findings and practical applicability – might benefit what are now quite old debates on this topic. To the extent that the chapter is thereby forward looking, it is an appropriate one with which to finish. Moreover, it points out the near certainty that this outstanding compendium will warrant amendments over time. If psychiatry is to meet the challenges of the substantial – and well earned – critiques currently directed at it, the conceptual underpinnings of its theories and practices must be subjected to rigorous examination and, where warranted, overhaul. Compiling a volume of this importance and scope is an ambitious undertaking; completing one of this quality is a prodigious achievement. The field is indebted to Professors Tekin and Bluhm and to the other 27 scholars who contributed chapters to this volume. Their work surely augmented my understanding of myriad aspects of an ever-broadening subdiscipline in which none of us can keep abreast of all developments. I look forward to using this resource in my teaching and I am confident that I will have ample company in that decision. G. Scott Waterman, M.D., M.A., is Professor of Psychiatry Emeritus at the University of Vermont in Burlington.